Merry Christmas & Happy Holidays To Everyone! It’s that time of the week and I promised Christmas themed entries for these two upcoming weeks, so here we go with week one. It’s Crayon Pop‘s turn to be here and they certainly are deserving. Crayon Pop officially debuted on June 24, 2012 and they started promotions in Japan. The group was apparently going to be called “Hurricane Pop” in the beginning, but that changed by their debut. I’m glad for that because “Hurricane Pop” doesn’t really seem like a good name for their style. Crayon Pop is mostly known for their song “Bar Bar Bar”, which some people might call “Jumping” because that’s the part they know the most. The official name of the song is “Bar Bar Bar”, but I guess you could call the dance the “Jumping Dance”. I don’t give it a name, but I guess you can do that. Crayon Pop is similar to PSY in the way that they both have other songs, but they are generally known for one particular song. This creates the false impression that they are “one-hit wonders”, but they are not. PSY has songs as far back as January of 2001 and I doubt many people know that Crayon Pop actually debuted with a song called “Bing Bing” and not “Bar Bar Bar”. It’s important to be well-informed, before creating judgments about a person or group of people. Crayon Pop has the “feel” of a J-Pop group and that might have been done intentionally, if you look at all their MVs. Crayon Pop might be an attempt to get the audience that likes the wacky-fun angle some J-Pop groups use for their fans. Although the group did not wear the outfits seen above in the MV, the skirts were reminiscent of these outfits and the stars were still on their helmets (thought being more transparent). This decision was likely made because the outfits seen above look difficult to dance in and the helmets are currently how people mostly recognize the girls of Crayon Pop. The song talks about being lonely on Christmas, but has the lyrics “Don’t worry, Be Happy” to not make the song depressing for those who can understand the lyrics. The video alone is enough to make you feel like the title “Lonely Christmas” is a joke and maybe it is supposed to be a joke. The girls never really look sad, except Way (웨이) who caused the camera to fall. Even then, that’s supposed to be funny and it works. The dance is fairly simple, as I mentioned before. It’s mostly them moving around in a circle or shaking their legs and moving from side to side. The song is meant to be a Christmas song to lift the spirits, despite the title and that means a complicated dance is not necessary. A nice note about the MV is that each member says their name with a line at the end of the video, which is like signing a Christmas card to their fans. It’s done when they are skipping in a circle and each takes time to say their line with their name, before the video cuts to the funny ending. Overall, the MV works for the purpose of making a fun Christmas song and getting more attention to Crayon Pop. I do believe that the song is very catchy and uplifting, but we’ll see how long Crayon Pop sticks to this style and those helmets they wear. The public can be very fickle and the same repeated style will turn off some people after a while. However, Crayon Pop is safe with this style for now and there is no worries about people getting tired of their cuteness just yet. Here’s some “Lonely Christmas” live! It’s that special time of year again! The Christmas spirit has hit the K-pop world and idols at the Music Bank Year End Special are making sure everyone feels the love. I have not seen such a idol-filled event, since Mnet Asian Music Awards (MAMA) 2013 and this happens every year just like MAMA. All the idols appear happy and there is little reason to not be happy now. The year is coming to a close and people should reflect on what they have and are grateful for in life. It’s easy to find the bad things, but there are good things to be happy about and the audience of this special have another thing to add to that “good list”. This special was very unique because of the special stages, hits from the past year and Christmas themed stages. The Christmas spirit filled the hearts of the idols and audience as performances went on, which included Christmas song performances in English as well. The special starts with a special stage with many idols, which included Naeun (A Pink), Wooyoung,(2PM) Hyorin(SISTAR), Niel(TEEN TOP), Seojun, Bora(SISTAR), Ailee and Dynamic Duo. The song was a combination of “Happy Together” and “Last Christmas”. Ailee came in to sing “Last Christmas”, which was done in English and quickly moved into the larger performance with all the idols mentioned before. It’s no surprise they chose Ailee to sing “Last Christmas”, since Ailee speaks fluent English and has a wonderful stage presence. The additional experience as a solo artist works well with her singing in English. Some idols might be nervous because they don’t have confidence in their English and then they are singing alone. This was a good move by Music Bank and the accompaniment of the other idols shortly after brings the idea of “unity” to the stage, which is a core value of Christmas. Crayon Pop came next with “Lonely Christmas” and “Bar Bar Bar”, which had the classic cute element to it. I like “Lonely Christmas” and it’s a cute song to dance to with the family, if they’re in a fun mood. They were followed by some of this year’s hits, which were VIXX’s “VOODOO Doll”, Girl’s Day’ “Expectation”, Dynamic Duo’s “Baam”, A Pink’s “No No No” (remix), Ailee’s “You & I” (remix), M.I.B’s “Men In Black” (get it? :3), Teen Top’s “Rocking” and “Miss Right”, miss A’s “Hush”, K.Will’s “You Don’t Know Love”, SISTAR’s “Give It To Me” (remix), Infinite’s “Destiny” (remix), EXO’s “Growl”, 4Minute’s “What’s Your Name” (remix), BEAST’s “Shadow”, IU’s “The Red Shoes”, 2PM’s “Come Back When You Hear This Song” (remix), KARA’s “Damaged Lady” and SHINee’s “Everybody”. Do you see this list?! Do you understand how big this event was now? You could not get tired in the audience and you had to stand if you did. These idols came out with their hits from the past, which had at least four MAMA 2013 winners (SHINee, Ailee, Dynamic Duo and EXO). Christmas was the real theme of the event, even if the technical theme was “End-Of-The-Year”. The audience has Christmas colored lights to cheer along to the performances, which were done with Christmas themed stages. The Christmas-themed stages were very special and interesting. The first one was by Nine Muses and it was “Santa Baby”. I can’t help thinking these girls are somewhere between the good and naughty list, but the performance was a nice one. They sang the song in English, which took me by surprise and it was done well. The speed of the song probably helped, since it is easier to speak or sing in a language when you can take it slow. Fellow Christmas stages were “Sleigh Ride” by Eunji (A Pink) and Kiwang (BEAST), “Let It Snow” by IU and K.Will and “Way Back Into Love” by Suzy (missA)and Junho (2PM). All these songs were sung in English and with no noticeable errors (if there were any), which really impressed me. There was some footage playing on a screen behind each of the English sung Christmas songs, but I don’t recognize the footage. It looked like it was from a movie. Some interesting stages were like covers of the songs, but noticeably shorter and involving more people than the original song/performance. These stages were Girl’s Day and VIXX performing “Now” by Trouble Maker, AOA and TEEN TOP with M.I.B performing “Gentleman” by PSY. These stages were very fun to watch, especially seeing Girl’s Day doing Hyuna’s part of “Now” and everyone in PSY’s “Gentleman”. The special ended with everyone singing a wonderful Christmas tune, which brought the special together to leave everyone with Christmas joy. It was a wonderful performance and I encourage everyone to find any streaming sites that show the special, if they find any and share them in the comments. Special Stage with Naeun (A Pink), Wooyoung,(2PM) Hyorin(SISTAR), Niel(TEEN TOP), Seojun, Bora(SISTAR), Ailee and Dynamic Duo. Crayon Pop with “Lonely Christmas” and “Bar Bar Bar”. Nine Muses with “Santa Baby”. A Pink with “No No No” (remix). Girl’s Day and VIXX performing “Now” by Trouble Maker. Ailee with “You & I” (remix)! AOA and TEEN TOP with M.I.B performing “Gentleman” by PSY. K.Will with “You Don’t Know Love”. SISTAR with “Give It To Me” (remix). Suzy (missA) and Junho (2PM) with “Way Back Into Love”. Eunji (A Pink) and Kiwang (BEAST) with “Sleigh Ride”. IU and K.Will with “Let It Snow”. 4Minute with “What’s Your Name” (remix). IU with “The Red Shoes”. 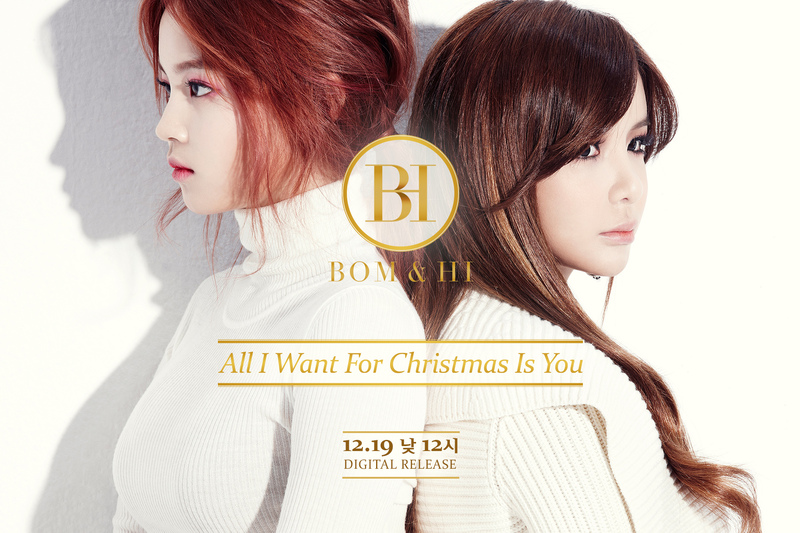 BH (Bom & Hi) Bring The Christmas Spirit! The time has finally come! Snow is falling in some places, bright decorations line certain streets and the Christmas spirit is starting to settle into the hearts of people everyone. Well, most people anyway. It’s around this time or a few weeks back that Christmas songs begin to play on the radio or in malls. The other thing that happens is Christmas songs get released. YG decided to use this opportunity to unveil a new unit. It’s known as BH (Bom & Hi), which is obviously composed of Park Bom from 2NE1 and “Monster Rookie” Lee Hi. A few teasers were revealed and it was said a darker theme would be presented by this song. One teaser had an ax in it for a few seconds and that same teaser ended with them having serious expressions. I thought they filming a Korean horror movie for a moment. I’ll admit that would be interesting to see, but it would definitely be too dark for my Christmas spirit. Anyway, the “darker” theme mentioned was actually closer to the sorrowful side. “All I Want For Christmas” has a beat that is fairly fast and uplifting, but BH’s cover of the song was slowed down and somber. It has a beat and feel like “Missing You”, which is a somewhat slow and emotional ballad. The teasers ending with Bommie and Lee Hi in these expressions tells the viewers the theme will be darker than the original song, but it was never made clear what that meant. Now the fact that it ended up being a cover was something that caught me by surprise. I know some people might have seen it coming, but I just thought it had a similar title to the song that Mariah Carey sung before. I thought this because similar titles is not something that is new to K-pop. There is 2NE1’s “Lonely” and now Hyolyn’s “Lonely”, as well as 2NE1’s “Hate You” and LADIES’ CODE’s “Hate You”. Anyway, I was not really disappointed and I ended up being fine with it being a cover. I recall Bommie not being eager to speak in English because of her accent, which she apparently finds embarrassing or so I’ve heard. I always wanted to hear the other members of 2NE1 speak in English because they can do it. Dara and Bommie noona can speak English fairly well and Minzy is still learning, but there is no better way to improve than practicing it. Magic is an option, but this isn’t the world of Harry Potter. Lee Hi speaks English very well and it should be noted that Simon of Eat Your Kimchi (EYK) mentioned teaching her for some amount of time, so there are no worries about her speaking English. I was happy when I found out it was an English cover of the song because I like hearing Bommie speak in English too. I recall an episode of “2NE1 TV” where she tried to get Minzy to order room service in English and ended up doing it herself (while not knowing the phone was on speaker the whole time ><). 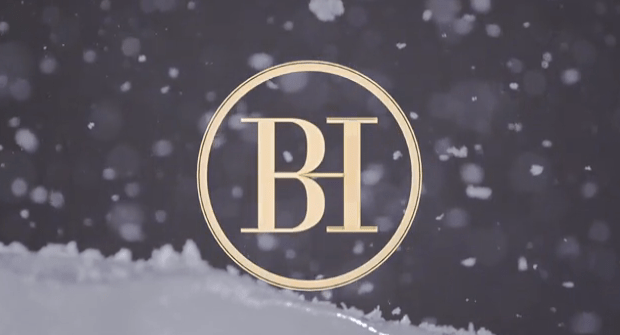 The symbol for this new unit is definitely creative in the way it combines the “B” from Bommie’s name and the “H” from Lee Hi’s name. The reason for the “H” and not an “L” is because the unit is promoted as “Bom & Hi”, not “Bom & Lee”. This is most likely because “Lee” is a common name in many parts of Asia, so it takes away from the uniqueness of the name. Nine Muses/9MUSES is a nine member girl group under Star Empire Entertainment. You might recognize this label as being the home of girl group Jewlery or boy group ZE:A. 9MUSES debuted back in 2010, which makes them a relatively new group. I don’t consider them rookies at this point, but your opinion might be different. The girls performed “Gun” on October 11th for M! Countdown and the official MV came out on October 13th, which charted at #16 on the Gaon Charts. This was an all-time high for this group, which could be a sign of their rising popularity. Position 16 might not sound impressive, but they are competing against groups with enormous fan-bases and hype. “GUN” is supposed to have retro influences with a Western feeling to the track. I’d say it succeed in doing that. The retro aspect is made clear by certain members having scenes with retro outfits and cliche scenes in the desert, such as the one above, make the Western feel very obvious. The set definitely helps set the Retro-Western theme and the outfits above can be argues as their main outfits for the MV. Each member gets to show their outfits and come off as confident, yet open to the guy in the MV. The theme for the MV appears to be about a guys who are too shy to approach girls. Lyrics like “Look, I’m pretending not to have seen you,/ look I’m pretending to be innocent/ Look, I’m pretending to be pretty/ I’m pretending to smile because of you, end this well” (which are part of the chorus) show that the theme is trying to tell guys to see when a girl is showing some reciprocation to their feelings. In other words, look for the signs when a girl is trying to tell you she is interested in you too. It goes along the lines of girls not outright telling guys they like them, but gives hints or signs that they do. Think the opposite of Girls Day’s “Female President” or along the lines of Dal Shabet’s“Be Ambitious”. At 2:56. you see the guy touch hands with one of the members and they have that cliche moment when both pull back momentarily, but the lyrics show that she is just acting innocent. The guy does not take this chance to make his move on her and she just walks away. He missed his chance and this is echoed in the two girls who look at him with expressions that say”Oh well”. The dance is simple and nothing that shows too much movement. The main components are the hands to the side when swaying in a downward motion, stretching outwards with one hand and having the other run along it, then posing in various positions. This does not mean the MV or live performance is any less valuable, but it would have been nice to see a little more in terms of a dance. Overall, I really like the song. The chorus is catchy, the outfits are wonderful and the setting is unique to me. I love that is reminded me of “Dukes of Hazzard” and that each member gets to show off their outfits with some screen time. The MV also does a great job of getting in some wide shots of the group. I believe this groups has a lot of potential and their name is also a creative one. In case people didn’t know, it is taken from the nine muses in Greek mythology. They are generally considered goddesses of the arts, so the name is a great one. I guess they are up there in the “not-so-modest” name category with DBSK, but they are a group I recommend keeping an eye on. Here’s the official MV for “GUN”! Here’s the live performance on M! Countdown. It’s been almost a year since Sunye of the Wonder Girls got married to James Park, who met the Wonder Girls‘ leader during missionary work in Haiti. Sunye became a mother of a healthy baby girl (I call her a “Wonder Baby) on October 16th of this year, which the newly wed couple have been parents for about two months now. Wonderfuls (Wonder Girls fans) were happy for Sunye, but some became nervous that the Wonder Girls would disband. It’s not a foolish thing to worry about because the member in question was the leader of the group and that has a big impact on the group. A group promoting without its leader is certainly odd, even if it is possible. Also, it was predictable that Sunye would want to focus on her new family after giving birth and sometimes new mothers fall in love with simply being a mother. Even so, JYP had repeatedly denied rumors of Wonder Girls disbanding and the members began solo activities. Now some new information has come out concerning another member of the Wonder Girls and it’s making everyone rethink what might happen to the group. The Wonder Girls have been doing solo promotions after Sunye got married and the group is currently labeled as “On Hiatus” by JYP. The member in question is Wonder Girls’ Sohee. Sohee is a vocalist in the group and a main dancer, while also being considered the “face of the group”. She has made a big name for herself in modeling and acting. Sohee has been in Vogue, Elle Girl, Ceci and COSMOPOLITAN to name a few famous magazines involved. She has also been in on many teleision shows (from variety to interview-types), three dramas (“Here He Comes”, “The Wonder Girls” and “Happy Rose Day”) and two movies (“Hellcats” and “The Last Godfather”). “The Wonder Girls” was a drama about the group that aired on the American television network known as “Teen Nick” and it should be noted that Sohee’s appearance in “The Last Godfather” was a cameo. Plenty of idols act as a “jack-of-all-trades” by balancing being a singer with acting, modeling and CF work. However, some do find the appeal of other trades like modeling or acting more appealing and make the transition. This is the case for Sohee and acting, which was confirmed by JYP recently. Sohee’s contract expires on the 21st of this month and a press release had confirmed that she will not be renewing her contract as part of the Wonder Girls. The reasons were apparently acting related and it was included that Yenny, Yubin and even Sunye would be renewing their contracts, but there were minor details involved. Various news about whether Sohee will stay with JYP or go to another agency was mentioned, but nothing is confirmed yet. It is not uncommon for group members to change or for some group members to pursue other career paths, but a member leaving the group usually has some kind of impact overall. I saw this news and wondered just what JYP could do. People have been curious about what would happen to the Wonder Girls because JYP did not have a clear plan for what would happen to them. Some people thought Sunmi would rejoin the group when she came back with “24 Hours”, but no such news has been announced. I don’t see her going back to Wonder Girls, but she might work with them at some point. Sunmi seems to be set as a solo artist now, but anything could happen. I just get a “solo vibe” from Sunmi now, who reminds me of Kahi, who was formerly a member of After School. The article that talks about Sohee not renewing her contract mentions Sunye renewing her contract with some kind of clarification of terms involved, which is a bit surprising. The group has been on hiatus for a while and the rumors of disbanding are fueled by little information on any kind of plan for the Wonder Girls. Some people say it is because JYP is focusing too much on missA or JYP had really given up on Wonder Girls, but I don’t believe it is either. I believe JYP is truly confused on how to go about handling the situation. Giving the group a hiatus while Sunye handles being a mother is fine, but it gives the other members time to find the appeals of other career paths. This is not necessarily bad, but that can mean they see more appeal in careers like acting. The transition from idol to actress or model can appear more appealing when even the members are not told about any details involving the future of the group. Some members might feel that the group will never come back and decide that going down a new path is better. This would also mean JYP really doesn’t know what to do with the Wonder Girls or is really not giving them much attention. I feel it is the former choice, but it’s a little of both at this point . Sohee deciding not to renew her contract and go into acting should be a “wake-up call” to JYP. Some kind of plan needs to be created to help fans feel at ease that the group will remain and perhaps even to assure the members that the Wonder Girls will return again. Whether Sohee would ever return to the group is uncertain and we’ll have to wait and see. Also, some Sunmi for those who don’t know her yet.